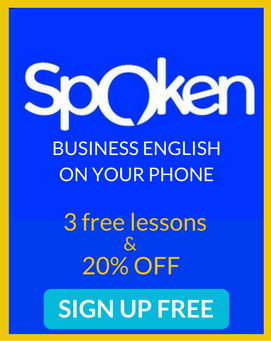 Want business English lessons in your pocket, all day long? Well, that might sound like trouble, but it’s not! Spoken.io is a very innovative and effective way to improve your business English. Use your messaging app, like Whatsapp or WeChat, to learn the necessary business jargon and impressive sounding vocabulary, and get your own native English speaking Business English coach. Hey there, Kevin here with another episode of the Feel Good English Podcast. Wow that was pretty intense. Feel Good English Podcast is that only podcast that’s helping you become more fluent in English and more fluent in life all at the same time. I am going to give you the opportunity to become better at specifically Business English. One of the hardest things with becoming a fluent, powerful, confident English speaker is finding ways to integrate English into your day every day. This is hard because we are busy, we have a lot of other things going on in our life and also because it’s often not fun, it’s not interesting so we just kind of put it to the side and don’t really focus on English. There is no better way to improve your English, to become a better speaker, than getting a little bit of English practice in every day. It doesn’t have to be a lot, it just has to be every day you have to continue learning just a little bit, even if it is only a few percentage points more, but you are continuing to learn everyday keeping English in your brain every day. I’m going to interview a guy named Henry Blue today and he has created a very cool innovative system for improving your Business English. His website, his app is called spoken.io and if you have been listening to the podcast for a while, you have probably heard of Spoken. It’s such a cool way to get Business English into your day; you use your own phone, you use your favorite messaging app like WhatsApp or WeChat. But I am going to talk to Henry a little bit about himself, about why he created Spoken.io and also what Business English really is, why do we need to focus on Business English as opposed to other, just general English? I don’t do a lot of Business English here on the Feel Good English Podcast, I might talk about some leadership qualities, management qualities, how to become better at business itself. But that’s why I wanted to bring Henry on and talk about Business English. If you are somebody’s “go-to” or if something is a “go-to”, it means you count on that thing or person when you need it, it’s your go-to, it’s reliable. You might have to go-to beer; what’s your go-to beer? That would be the beer you choose when you don’t really want to think about choosing another beer. Anyway enough about beer, I do like beer, but let’s get into the interview. I am going to talk to Henry, talk a little bit about what he does and if you are interested you can also sign up for his program, it’s free to try, so that’s cool. I will tell you more about that at the end of the interview. By the way, I am going to offer a free transcript to this interview, so if you want a transcript to this, go to www.feelgoodenglish.com, search for the interview with Henry and you will find a link for a free, totally free transcript. Cool eh? Kevin: Hey Henry, how are you doing? Henry: Hey, I am doing great Kevin, thanks for having me on Feel Good English. Kevin: Yes, thanks for being here man, I am excited to have you on, you’re kind of the Business English guy. It’s very challenging for me as an English teacher to focus on Business English and it’s never really been my area of expertise. It’s different than normal English kind of the ways that we encounter business situations in general is different, then having to go into those situations in a foreign language can be challenging and I have always kind of passed that on to other teachers. You Henry, focus on Business English, that’s what you do, that’s what you help people with. What do you think are some of the main differences, more of the foundations of Business English versus just learning English just for travel or to communicate with other people; what do you think are some of the man things that might challenge students when they are trying to become a confident and competent English speaker in business situations? Henry: Sure. Well I have two thoughts and I think you touched on this, Kevin. But in business interactions, there is usually a very, very clear purpose; people meet in business in order to get deals done, in order to get new jobs, in order to progress their business, in order to network for future opportunities. So there are a lot of situations that are goal oriented and people in business situations don’t always have a lot of time, so you need to learn how to accomplish your goals, whether it is to impress somebody in an interview, whether it is to get the right deal, whether it is to talk to a colleague who needs to improve their performance, or if you could just use what we call “a pick me up”, you know, a little boost to their morale, so they are more happy and perform better. The other thing about Business English that is hard is the jargon and the idioms. People in different industries use language with each other that they don’t use elsewhere, that they don’t use at home. And it is kind of like saying, “Hey, we are all in the same club.” And so that is one challenge that we work on a lot is, with Spoken, we put people in business situations and we help them learn the phrases. And just those phrases when you start to become familiar with them, they help you build relationships with other people in the industry and they help you be on the same page as everybody else. Kevin: You kind of nailed it there, and it’s actually a positive thing and a negative thing I think and that is the whole fact of being goal oriented. So you have a little bit more pressure when you are in a business situation because there are certain things that you want to accomplish. On the other hand, focusing on your English abilities you know exactly where you need to focus, and it gives you a very clear path of what you need to work on. So Henry, tell me how you came up with the idea for Spoken. Henry: Sure, so Spoken, we are actually renamed to Spoken.io so it’s easier to find us, Spoken.io. And basically what we do is we help people connect to native instructors to learn Business English through their favorite messaging platforms; so WhatsApp, WeChat, Telegram. Because, what I learned over time is that learning English is hard, it takes time and sometimes the biggest hurdle for people, the biggest challenge is finding that time. Henry: And what we thought was well, people have time to text, people in Brazil spend an hour on WhatsApp a day almost, it is something that’s very convenient, that’s why people spend so much time communicating with people through messaging apps, whether it’s voice messages, text messages. And so we thought what if you could learn anytime through your messaging app? You know, through WhatsApp, then you wouldn’t have to meet somebody at a coffee shop to have a tutoring lesson, or you wouldn’t even have to be at home with good wifi and be ready for the camera; it can be as a convenient as you want. So that’s why we started creating Spoken, to let learners learn the topics they want to, especially Business English, at the convenience of their own messaging app. Kevin: Yes, and that is very very smart. And after many years of teaching English I think that is the biggest challenge, the number one biggest challenge is keeping English in your life from day to day because in my opinion, the equation is simple, the more consistent you are with learning and the longer you do that, the better you will become period, no matter who you are. So finding ways to put English into your day without having to stop and kind of focus on it, you just can go about your day and your English friend, your English tool, is there and it’s literally there when it is on your phone and your messaging app, so that’s awesome. So, to give the listeners a little bit better idea of exactly how it works, take us through a week of an English learner using Spoken, what would their week look like when they are a Spoken.io subscriber? Henry: Sure, sure. So let’s start with the beginning, the first thing they can do is take out their phone and open WhatsApp or Telegram or whatever messaging app they want and they can just message “Schedule” in Spoken and then they will have the option to anytime they want a lesson, very easily pick that lesson and pick that time and any time they want aside from that they can message their coach too. Every learner is paired with a coach and when you have a lesson, your coach picks one that is focused for you. So let’s say it’s chairing a meeting, how do you run a meeting with people? You are going to get a lesson that’s going to have images and audio and vocabulary flash cards that help you learn the material you need to and then you’ll work through that lesson with your coach. So there’ll be some speaking exercises and then maybe even some role-play exercises, you know make sure you can run the meeting, make sure you can avoid distractions when people try to take you off course, stick to the agenda. And at the end, there are some little quizzes too and the great part about messaging is any time you finish a lesson, you can always go back and review all of the materials; review the flash cards, listen to your audio messages again, and it’s always right there for you to put in the extra work if you want to go the extra mile too. Kevin: Very cool, it’s about as practical as it gets it sounds and that’s so smart that you integrate it with the most popular messaging apps. And what I found is the majority of learners find it hard to create time in their day for learning; there is a small percentage that love learning English and they will always find the time, but for that other majority, making it as easy to access as possible helps them stay focused. So cheers to you, it’s a great app, I know it’s going to continue to grow and I know hope the listeners out there try it out, especially if you are into technology and using smart apps to learn from, this is for you. Listeners out there, if you are curious, take that next step, take that quick action and go check them out at spoken.io. Henry, thanks so much for being here, I do have one more question here for you. At Feel Good English we talk a lot about life issues and dealing with life and motivation and inspiration and challenges as well; we all deal with challenges in life, so I have a little question here for you, Henry, what scares you in life? Henry: Good question. What scares me? Well I think maybe the unknown scares everybody, but what scares me is maybe more not being prepared for the unknown, especially when you have a business, you don’t know what’s around the corner always. So I try very hard to make sure that I am prepared to handle the unknown; it scares me if I feel unprepared for what might come next, so that means staying on top of my “To do’s”, scheduling my tasks in a calendar so I know exactly when things need to be finished, so if something big happens I know I can tackle it, I can address it without dropping my other responsibilities for instance. So it’s just trying to do the things I need to do, get plenty of sleep, manage time just so I can be prepared for what’s around the corner. Kevin: Very cool, so it sounds like you are kind of maintaining all of the different areas of life, health and business so you can be prepared for things that come that you aren’t expecting because of this underlying kind of fear of not being prepared. Is that right? Henry: That is correct, exactly. You never know what life is going to throw at you, so even if you do all the right things, things can still pop up and I think life is about how you react, a lot of life and business is about how you react to things that you did not plan on, so for me it is important to try to be prepared for those. Kevin: Very valuable lesson, thanks for sharing that, I know I threw that question on you without you preparing so you are prepared for that question anyway, right? Kevin: So thanks Henry for being here; are there any last words of wisdom you would like to share with the Feel Good English audience? Henry: Sure, I think in general, by listening to an English podcast and by wanting to improve your English, you have already taken the first step; but never be afraid to get out of your comfort zone, you’ll be surprised at how much you realize that you can actually do and how many opportunities take once you get out of your own way. There are so many hurdles in life, we don’t need to be one, our mental state does not need to be one. So I think when we take the first step to doing something that is unique and maybe a little scary for us, that is a big step that we can take mentally. Kevin: Very valuable lesson and thank you for sharing that. Thanks again for being here Henry, I hope people go check you out at Spoken.io; you get to try it out for free so there is nothing to lose. Thanks again for being on the podcast and we will talk to you soon. Henry: Sounds great Kevin thanks so much and chat later. So question for you, are you scared about not being prepared with Business English? If this is a fear of yours, go check out spoken.io. 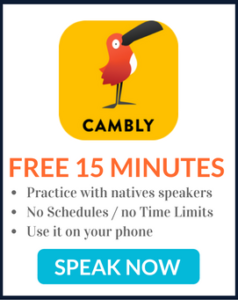 If you go to the website Spoken.io, you will find details there, how to get two free lessons. Enter the offer code “Feel Good English”, you will get an extra twenty percent off on your first month of lessons. If you like technology, if you like making things easy and if you need to put “Improve Business English” on the top of your “To do” list, go check out Spoken. Until the next episode, have a wonderful week, keep practicing just a little bit every day, and keep being courageous. Talk to you soon, bye bye.